School Performance Score | Educate Now! 2011 Scores are In — New Orleans is #1 in Growth! any other school district in Louisiana. Educate Now! calculates that the combined DPS for New Orleans should be around 82.4. 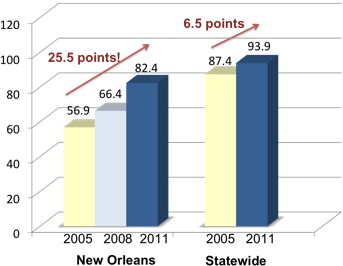 This means that New Orleans has grown a stunning 25.5 points – 49% – between 2005 and 2011! The 2011 combined DPS for New Orleans was calculated by Educate Now! The Louisiana Department of Education has just released the 2010 School Performance Scores (SPS) and District Performance Scores (DPS). So, how did New Orleans schools do in 2010? Myth 4: If a school kept its name, it must be the same. Fact: For many schools, only the name is the same. Comparing the performance of individual New Orleans public schools with the same name pre- and post-Katrina is not a valid analysis. Why? We shuffled the deck.